Well, it finally arrived: my Apple Watch! Despite the fact that I ordered my 38mm Space Grey, Black Sport Band model within the first 3 minutes of pre-orders back on April 10th, I didn't receive my watch on launch day (April 24th), but instead received it this past Wednesday April 29th. Apparently there has been a supply constraint due to poor components or something. So, what exactly is going to be the purpose of this, and coming blogs you may ask? Well, I am not a tech reporter. In fact, I don't even really want to get into the more technical aspects of the Apple Watch, as I know of many other sources that have done, and will continue to do, a fantastic job at covering that. Instead, I am going to share my experiences with the watch, how it interacts with my active lifestyle, how accurate I feel the health tracking is, what health apps I enjoy, how it improves or plays a part in my job as a Strength and Conditioning Coach, as well as reviewing the watch and apps along the way. I am fascinated by wearable tech, especially products that track and analyze our health data. In fact, I have worn a Jawbone UP24 for several months now, and although it gave me a lot of metric data, I felt like I wanted more. I am really intrigued by the Apple Watch, not only as a current product, but also where it is heading in the future, so it is a lot of fun to be in on that from the beginning. So, what exactly are my thoughts after using this watch for about 24 hours? 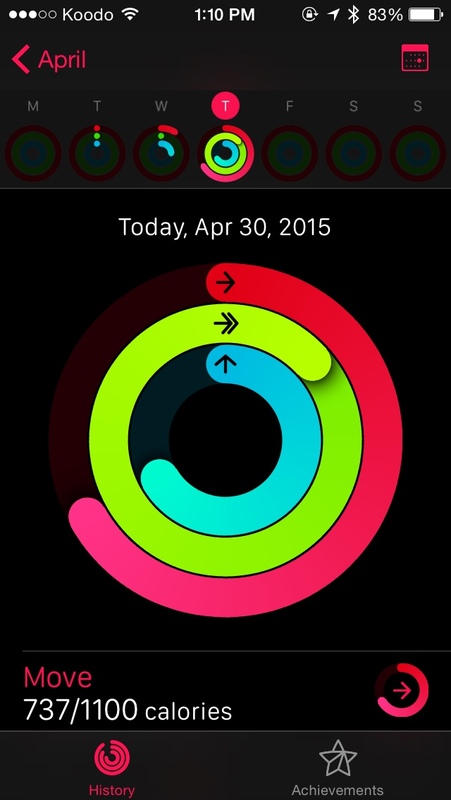 The Activity App has 3 rings that must be filled each day: Move, Exercise, and Stand. Move is pretty simple, you set a goal based on what your daily activity level is like and then move your way to that goal. As far as I know, the accelerometers in the watch track the amount you move, mainly via the number of steps you take. 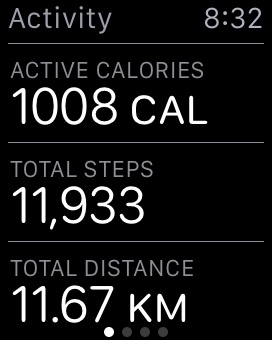 I believe I selected the "moderate" goal at the beginning of the day, but between doing some mobility work in my home gym, walking my boys to daycare, and then going for a 4.5km run, I was nearly at my activity goal by 10am. I think this will take some adjusting over time based on what I believe my average amount of activity is and then set my target there to try and hit every day. 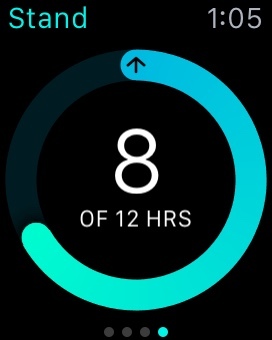 The trickiest part will be to try and hit the same activity target on Sunday, which tends to be my least busiest day, but I believe the motivating factors of the watch will help me get there (more on that later). I am on my feet quite a lot throughout the day. Training my clients, leading instructional sessions, and then also training my athletes before coming home to chase my 3 and 1 year-old around, it is quite easy for me to hit 8-10k steps daily. 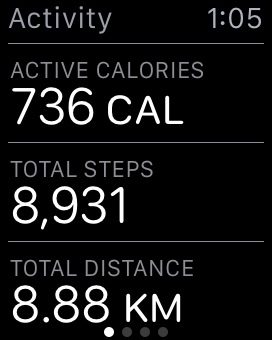 Stand is the one segment of the 3 that make up the activity app that I believe could use a little work from Apple. Sure, the watch notifies you to remember to stand if you haven't been up during that current hour. The problem here is that this target seems to reset every hour on the hour. 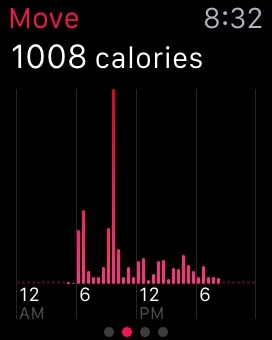 When I wore my UP24, the band would recognize if I hadn't moved around within the past 30 minutes (that could be adjusted) and buzz. The Apple Watch isn't as smart, at least not yet. Let's say you are extremely active from 11:00-11:59am, but then sit from 12:00-12:49pm, at 12:50pm the watch will tap you to remind you to get up. This seems to be every hour at 12:50pm regardless of when you moved last. It should be noted that some are even reporting that even standing at a desk doesn't seem to count. It should be called "Stand and Move," or something similar because standing up from your chair doesn't cut it. You actually need to move around for a good minute or so before it registers that you have been up. 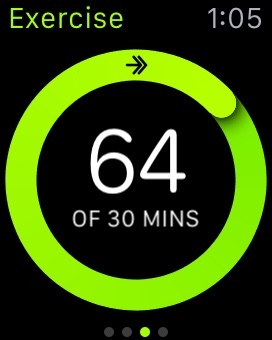 To be honest, I really like this feature and hope that it gets tweaked a bit further to be as great as some of the other fitness bands on the market. Exercise ties in with the Workout App (more on that later). Exercise must be at least 30 minutes, but can be anything equivalent to, or greater than a brisk walk. For some people 30 minutes of daily exercise may sound too easy. For others, 30 minutes may seem like a daunting task. 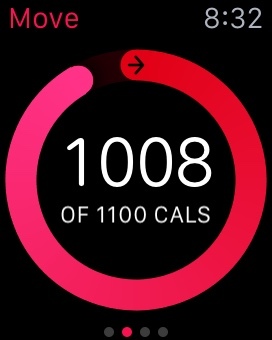 I hope to see some customization from Apple in the future with regards to their exercise regulations so that some folks who like to exercise a lot can set their standards a bit higher. There are a few options available to choose from here: Outdoor Run, Outdoor Walk, Outdoor Cycle, Indoor Walk, Indoor Run, Indoor Cycle, Elliptical, Rower, Stair Stepper, and Other. This app seems to work really well with some of your traditional "cardio" workouts, but is definitely lacking in appropriate tracking for things like strength training, circuit training, yoga, etc. You can select "Other" as your workout, but ultimately I am hoping that more 3rd party apps are released to more accurately track these various types of workouts. For example, I really like doing more traditional strength training lately; higher intensity, lower repetitions, longer break periods. That probably doesn't track too well on a fitness tracker like this that is basing its calorie burn by collaborating movement data with heart rate data. Having said that, the run tracking seems to work quite well, and will only become more accurate the more I use it. Here's why: The Apple Watch itself does not have GPS tracking in it. Apple suggests going for a walk or run with your iPhone a couple of times so that the watch can compare its data with the GPS tracking of your phone to develop a better understanding of your stride. Eventually, the watch will be able to learn more about you and how you run so that you won't need GPS from your phone to get an accurate measurement of how far you've run. 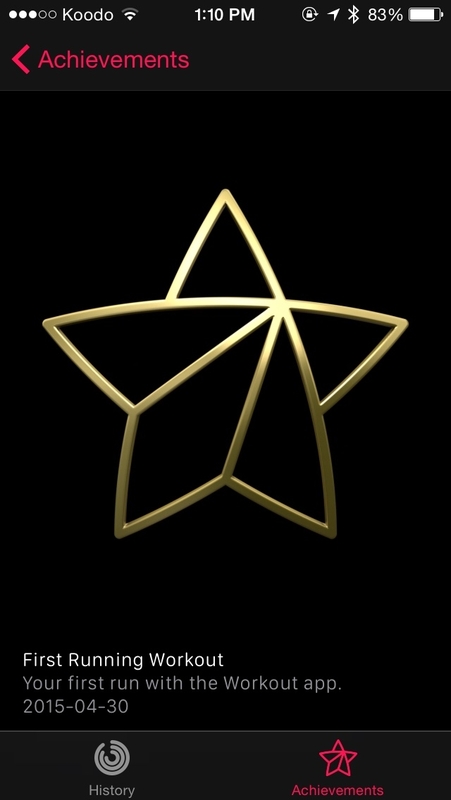 One of the best things about the Workout and Activity apps, in my opinion, are the Achievements. Sure, this is going to sound super dorky, especially coming from someone, such as myself who considers himself to be a pretty motivated person, but I can actually see myself striving to unlock some of these Achievements. 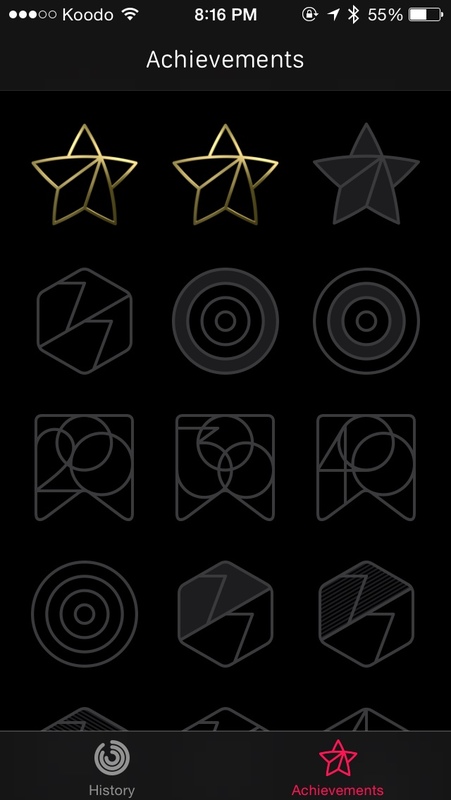 Sure, they are essentially worthless prizes, but they do signify an accomplishment, and something that I can see being very motivating and special to a lot of people. It turns fitness into a bit of a game with actual goals to strive towards. Well, that's it for now. I will continue to jot down various ideas about things I want to write about. If you have any questions or wish to see a specific topic or app covered in the blog, let me know by sounding off in the comments below, and stay tuned for plenty more! Thanks. TRF Plus May 2015 is here!